On a lazy weekend, one of those where the couch is both your launch pad and your destination, I sat with my wife and (at the time) two year old daughter watching TV and trying to figure out what we were getting for all the money I had just spent on Amazon Prime. The streaming service, as we deduced, was home to a good amount of TV shows and movies, but also serves as the digital carrier for Nickelodeon. My daughter would see us scroll past Bubble Guppies and Dora Explorer ready tap me out like a chi-blocker for not stopping on them. Having reached whatever my weekly allotment and tolerance of cartoons that ask questions and then stare at me for 30 seconds waiting for my answer, I figured, “You want to watch a cartoon? Fine, we’ll compromise.” I found Book One of Legend of Korra streaming for free and gambled that my daughter’s filibuster for more Dora would concede. It did. At the time, Book Three of Korra had just began (and was still being aired on TV), so I was in full Korra fandom. But something changed after that weekend. Over the course of 10 days, the three of us watched the entirety of both Book One and Two (my wife seeing Book Two for the first time, but was a fan of the first one). I probably would’ve stopped after however far into the catalog we travelled on that first day, but suddenly, my daughter’s typical requests for Doc McStuffins or Pocoyo (excellent animation if you’re not hip) we’re replaced with, “Daddy, I want to watch Korra. Daddy, what happened to Korra?” What kind of father would I be to deny her that? And beyond your standard, “how much TV is acceptable for a toddler argument,” (that I couldn’t be less interested in debating right now), there was a practical hypothesis for why she wanted to keep watching Korra. Maybe it was the new shiny thing. Maybe it was much more than that. For people that shrug their shoulders or roll their eyes when it comes to representation on TV, my daughter is a pretty good test study. She will watch or indulge just about anything that is aimed at her demographic, but she consistently veers towards characters that look closer to people of color, like Dora Explorer or Doc McStuffins. You know, people that look like her. As Carrie has eluded to before, representation can have a profound effect on whomever consumes it. My daughter has All Doc McStuffins everything, but the reality is, almost all kids have All Doc McStuffins everything because she’s that great. But there’s a big difference between the lovable pigtailed girl who can talk to her toys and the confident and boastful teenager /young adult who harnesses all the physical power in the world, but has to learn how to navigate the world diplomatically. I want Doc to be my daughter’s best friend. I want Korra to be the woman my daughter aspires to be. With two seasons worth of recaps and more than a few editorials, I’m not exaggerating when I say that I’ve spent close to 30K words on the Legend of Korra and the character of Avatar Korra already. This isn’t a column (exclusively) about how awesome Korra is (I already know how awesome Korra is…she’s awesome). This is a column about how my daughter once tackled me, stood on my chest and yelled, “I’m the Avatar, you gotta deal with it!” This is a column about her looking over my shoulder while I was editing a Legend of Korra recap and then asked me put her hair in ponytails and roll her sleeves up past her shoulders to show her muscles like Korra does. My daughter didn’t just want to do the things that Korra did on TV because she was a super hero; the way that boys run around showing their open palm to people after watching Iron Man. She sees herself in Korra in a fashion she hasn’t with other characters on TV before. I always defended Korra and I’m not alone, to the people that compared her unfavorably to Aang or bemoaned her temper or impulsiveness. 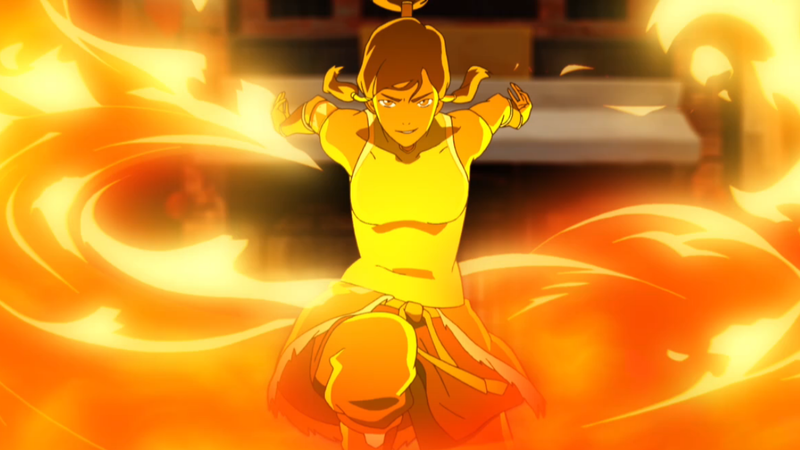 I chalk much of that critique up to sexism because we embrace 100 new male protagonists with the same personality traits every year, but I ultimately loved Korra because of how relatable her personality was in a universe blanketed in fantasy. It’s been a joke among my friends for a while, but I often feel like I’m raising the Avatar. My daughter is smart and gifted in her physical attributes. She already seems to be good at about everything we throw at her. She’s also bossy, head strong and impulsive. What she will be allowed to have, which Korra was allowed to have (and most TV characters don’t have) is a real emotional arc that charts maturity and resourcefulness. I really look forward to years down the road, where I might have the opportunity to revisit Legend of Korra with my daughter when she can understand many of the more mature themes at work on the show, the likes of which managed to elude its critics from time to time as well. Legend of Korra has run its course as far as new episodes go and despite all the ways that Nickelodeon tried to cripple its own product, it wrapped up the series on its own terms and in the most beautiful way possible. But my connection to that world, that vision of maturation and rebirth and that untouchable protagonist is something that won’t fade away so easily for me. When my daughter takes a bath, we splash each other and call it waterbending. I told her I would teach her to earthbend when it’s spring out and we replant our garden. Like, Korra, she’s taking longer to master airbending: like blowing up balloons or blowing her nose consistently. Doesn’t fit her personality much. It’s gotten cold in Ohio lately, so we’ll probably start using the fireplace more soon…I haven’t figured that one out yet. But I better figure something out soon, my daughter needs to master all the elements. Daughters should receive all available tools at their disposal. The world depends on it. Great article – hoping I can escape 8 hours of Peppa Pig one day.